This digitally-composed work, part of the artist’s Landscape series (LS-Landschaft), c. 2000, stands in the postmodernist mode, which decrees that all cultural products come with the baggage of the maker. The artist’s cut and paste landscapes reexamine the legacy of European pastoral painting with a critical edge. 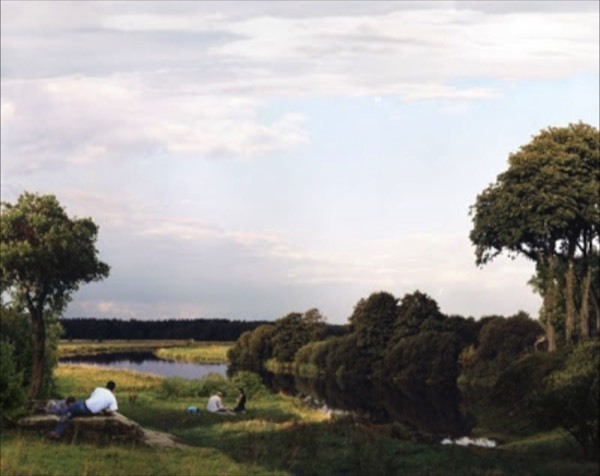 Three different groupings populate the bucolic photographic river scene, which alludes to the formal structure of seventeenth century northern landscape. Gütschow displays the printing instructions and full border of the print to underline her critical concerns.